Some isoquinoline alkaloids from Macleaya cordata (Willd). R. Br. (Bo Luo Hui) exhibited antibacterial, antiparasitic, antitumor, and analgesic effects. The targets of these isoquinoline alkaloids are undefined. This study aims to investigate the compound–target interaction network and potential pharmacological actions of isoquinoline alkaloids of M. cordata by reverse pharmacophore database screening. The targets of 26 isoquinoline alkaloids identified from M. cordata were predicted by a pharmacophore-based target fishing approach. Discovery Studio 3.5 and two pharmacophore databases (PharmaDB and HypoDB) were employed for the target profiling. A compound–target interaction network of M. cordata was constructed and analyzed by Cytoscape 3.0. Thirteen of the 65 predicted targets identified by PharmaDB were confirmed as targets by HypoDB screening. The targets in the interaction network of M. cordata were involved in cancer (31 targets), microorganisms (12 targets), neurodegeneration (10 targets), inflammation and autoimmunity (8 targets), parasitosis (5 targets), injury (4 targets), and pain (3 targets). Dihydrochelerythrine (C6) was found to hit 23 fitting targets. Macrophage migration inhibitory factor (MIF) hits 15 alkaloids (C1–2, C11–16, C19–25) was the most promising target related to cancer. Through in silico target fishing, the anticancer, anti-inflammatory, and analgesic effects of M. cordata were the most significant among many possible activities. The possible anticancer effects were mainly contributed by the isoquinoline alkaloids as active components. 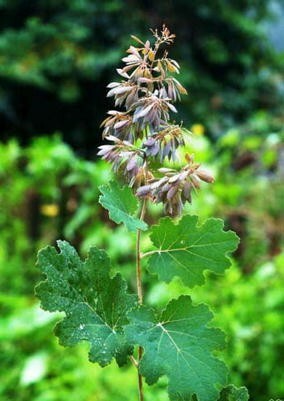 Macleaya cordata (Willd). R. Br. (Bo Luo Hui) (Fig. 1) has been used for the treatment of cancer , insect bites , and ringworm infection  in Mainland China, North America, and Europe. Phytochemical and pharmacological studies demonstrated that the isoquinoline alkaloids derived from M. cordata are its major active components . Thirty isoquinoline alkaloids have been isolated from M. cordata (Fig. 2), including chelerythrine (C12), sanguinarine (C15), sanguidimerine (C17), chelidimerine (C18), berberine (C21), coptisine (C23), allocryptopine (C24, C25), and protopine (C26). These alkaloids exhibited a broad spectrum of biological activities, such as antitumor [5–8], anti-inflammatory [9–11], antimicrobial [12–14], analgesic , and antioxidant  activities. In our previous study , we found that M. cordata could be counted not only as one of the richest resources in Mainland China among all species of the tribe Chelidonieae, but also as one of the most promising natural resources for drug discovery. M. cordata has gained the attention of pharmacognosists since early 1990s (Fig. 3). However, its obscure molecular actions have hindered its use in drug development. Although protein–ligand docking techniques have been available in virtual drug screening for specific targets, such as tumor necrosis factor α-converting enzyme (TACE) , inducible nitric oxide synthase (iNOS) , and Janus-activated kinase 2 (JAK2) , these docking approaches to virtual screening are often too computationally expensive . This study aims to investigate the compound-target interaction network of isoquinoline alkaloids of M. cordata by reverse pharmacophore database screening technology, and outline its potential action mechanisms. Figure 4 shows the workflow of this study. The structures and bioactivities of the isoquinoline alkaloids of M. cordata were collected by literature review . The alkaloids were then applied to target fishing with two pharmacophore and target databases, PharmaDB and HypoDB. The hit pharmacophore models were picked out according to the threshold of a predetermined fit value. The results from PharmaDB screening were compared with those from HypoDB screening. After analysis of the hit targets and their associated pathways and diseases, as well as the interactions between the alkaloids and the targets, an action network of M. cordata was constructed. Literature retrieval was simultaneously carried out to verify the findings. The active components of M. cordata were collected from our own database  and the literature. All 26 isoquinoline alkaloids of M. cordata and their bioactivities are listed in Table 1. As shown in Fig. 2, the alkaloids were divided into three classes: benzo[c]phenanthridines (Ben, C1–C18), protoberberines (Ber, C19–C23), and protopines (Pro, C24–C26). Based on the replacement of the C-ring, C1–C9 belong to the dihydro-benzo[c]phenanthridines, C10 is a N-demethyl subtype, and C11–C16 are quaternary ammonium bases that share an iminium moiety (C=N+). The remaining two bisbenzo[c]phenanthridines (BisBen, C17–C18) are epimers to one another. The structures of all 26 alkaloid candidates were prepared in MOL format, and converted from 2D drawings to 3D models. Their energies were minimized by the software Discovery Studio (DS, v3.5) developed by BIVIA (USA) with the CHARMM force field. A Monte Carlo-based conformational analysis (FAST mode) was performed to generate conformers from the initial conformations. The maximal 255 conformers were allowed with an energy interval of 20 kcal/mol. These alkaloid molecules were rigid, and the number of conformers for each compound was much fewer than 255. Hence, a total of 135 conformers were generated for the 26 isoquinoline alkaloids. A pharmacophore model represented a series of common features of a set of ligands with a special pharmacological target. The features of a pharmacophore model reflected the target–ligand interaction mode. Pharmacophore-based virtual screening was an alternative to docking. By fitting a compound against a panel of pharmacophore models derived from multiple pharmacological targets, the potential targets of the compound can be outlined. Automated ligand profiling was available in DS 3.5 as the so-called “Ligand Profiler” protocol. The software offered automated pharmacophore-based activity profiling and reporting . In this study, the default parameters of DS 3.5 were used. For each candidate ligand, three or more features were mapped. DS 3.5 was equipped with two available pharmacophore databases, i.e., HypoDB  and PharmaDB . HypoDB contained about 2500 pharmacophore models derived from protein–ligand 3D complex structures as well as structural data on small bioactive organic molecules. PharmaDB was created from the sc-PDB, a well-accepted data source in structure-based profiling protocols. The sc-PDB was a collection of 3D structures of binding sites found in the Protein Data Bank (PDB). The binding sites were extracted from crystal structures in which a complex between a protein cavity and a small molecule ligand could be identified. PharmaDB consisted of about 68,000 pharmacophores derived from 8000 protein–ligand complexes from the sc-PDB dataset. PharmaDB is a new and updated pharmacophore database developed in collaboration with Prof. Didier Rognan [25, 26]. The target and pharmacophore models from PharmaDB and HypoDB were not entirely consistent. PharmaDB had a larger quantity of targets, while the models in the HypoDB were fewer and described as being experimentally validated. Therefore, in this study, PharmaDB was employed in the target fishing, and HypoDB was used to validate the results. Regarding PharmaDB, multiple pharmacophores with shape or excluded volume constraints were generated for each protein target. For the pharmacophores with shape constraints, the suffix “-s” was added to the name. In addition, a numerical suffix referred to the ranking of selectivity evaluated by a default algorithm in DS v3.5. In this study, only the best models with “−1” in their names were employed in the ligand profiling . For each pharmacophore database, a classification tree was available, from which the individual models could be selected. In the profiling with PharmaDB, all the pharmacophore models with the shape of the binding pocket were selected for the virtual screening with default settings. The RIGID mode was used as the molecular mapping algorithm. No molecular features were allowed to be missed while mapping these ligands to the pharmacophore models to increase selectivity. The minimal inter-feature distance was set at 0.5 Å. Parallel screening technology for one or more compounds against a multitude of pharmacophore models was available as a Pipeline Pilot protocol. The number of parallel processing procedures was set at 4. The whole calculation was carried on a T5500 workstation (DELL inc., USA). All the poses of the ligands mapped into the pharmacophore were preserved. A series of target-ligand pairs were selected as emphasis for further examinations. The selection was based upon compatibility with the reported pharmacological activities, as well as traditional usage of M. cordata. A further refinement was carried out in Molecular Operating Environment (MOE) developed by CCG (Canada) to identify the protein–ligand binding modes. Energy minimization was carried out by conjugated gradient minimization with the MMFF94x force field, until an RMSD of 0.1 kcal mol−1 Ǻ−1 was reached. An interaction table between alkaloids and targets was presented as the ligand profiling results. For each target, the name and pathway information were collected from the PDB and KEGG. The diseases related to the targets were collected from the Therapeutic Target Database (TTD; http://bidd.nus.edu.sg/group/cjttd/)  and DrugBank (http://www.drugbank.ca/)  databases. Compound-Target-Pathway networks were generated by Cytoscape 3.0 (Cytoscape Consortium, USA) . In the networks, nodes represented the compounds, targets, and biological pathways. The edges linking the compound-target and target-pathway represented their relationships and were marked with different types of lines. After the network was built, the basic parameters of the network were computed and analyzed. The profiling results are presented in two HTML tables, designated MoleculeFits and PharmacophoreFits. Two descriptors, fit value and shape similarity, were used to measure the fitness of the ligand and pharmacophore. A fit value equal to or greater than 0.3 was used as a heuristic threshold to select targets from the activity profiler. For each pharmacophore model, the classification information of the target can be indicated in a HTML table created by DS 3.5 called as Pharmacophores. Finally, 98 pharmacophore models were mapped. The models belonged to 65 protein targets, and were involved in 60 pathways. A complete list of the 241 target-ligand pairs is shown in Table 2. The name and indication information of the targets are shown in Table 3. The 13 targets verified by HypoDB screening are marked with an asterisk in Table 3. A topological analysis of the interaction network offered insights into the biologically relevant connectivity patterns, and highly influential compounds or targets. Some Chinese medicines had been investigated by interaction network analysis [30–32]. The pharmacological network of M. cordata had three types of nodes (Fig. 5). The 26 alkaloid nodes formed the core of the network, and were surrounded by 65 target nodes. Each target was linked to at least one pathway. A total of 60 pathway nodes constituted the outer layer of the network. Each alkaloid was the center of a star-shaped action net except for the two bisbenzo[c]phenanthridines (BisBen), which were only linked to one target and one pathway, respectively. The alkaloids and targets were strongly interconnected in many-to-many relationships. A general overview of the global topological properties of the network was obtained from the statistical data by the Network Analyzer of Cytoscape. The diameter of the network was 8.0, the centralization was 0.14, and the density was 0.024. The node degree indicated the number of edges linking to other nodes. The highly connected nodes were referred to as the hubs of the network. The degrees of all the alkaloids (Fig. 6a) and important targets (Fig. 6b) were investigated. The compounds with higher degree values, such as C5, C6, C9, C19, and C20, that might participate in more interactions than the other components were the hubs in the network. The target degree values mostly ranged between 2 and 7. The targets with the highest degree values included MIF (16), TTR (11), FabZ* (11), ERα* (10), and MR (10). The targets with higher degree values might be involved in the pharmacological actions of M. cordata. By mining the PubMed and TTD, the targets of M. cordata in the PharmaDB profiling results were annotated with biological functions and clinical indications (Table 3). Furthermore, the targets were classified according to the reported pharmacological activities of M. cordata as follows: microorganism (including bacterial, fungal, and viral) infection (12 targets, with 3 targets verified by HypoDB screening), parasitic disease (5 targets, with 2 targets validated by HypoDB screening), pain (3 targets), cancer (31 targets, with 8 targets confirmed by HypoDB screening), inflammation (8 targets, with 1 target verified by HypoDB screening), and injury (4 targets, with 2 targets fished by HypoDB screening). The extracts and their purified alkaloids from M. cordata exhibited notable activities against Staphylococcus aureus, Pseudomonas aeruginosa, Escherichia coli, Bacillus subtilis, Tetracoccus spp., and methicillin-resistant Staphylococcus aureus (MRSA) [12, 33]. In this study, 12 proposed targets were closely related to microorganisms, and seven of them exhibited antibacterial activities (Fig. 7). the key types of alkaloids with antibacterial activity were dihydro-benzo[c]phenanthridine alkaloids and protoberberines. Five targets (LmrR, TEM-1*, CAT, FNR, and ActR) were related to multidrug-resistant bacterial strains. LmrR, a multidrug binding transcriptional regulator and the predicted target of C11, was a PadR-related transcriptional repressor that regulated the production of LmrCD, a major multidrug ABC transporter in Lactococcus lactis [34, 35]. TEM-1* (TEM-1 beta-lactamase) fished by C19 was one of the antibiotic-resistance determinants for penicillins, early cephalosporins, and novel drugs from their derivatives . A new drug, Avibactam™, innovated by AstraZeneca is a TEM-1 inhibitor that has already entered phase III clinical development . In addition, chloramphenicol acetyltransferase (CAT), an antibiotic-inactivating enzyme predicted by C11, catalyzed the acetyl-S-CoA-dependent acetylation of chloramphenicol at the 3-hydroxyl group and resulted in chloramphenicol-resistance in bacteria . Ferredoxin-NADP+ reductase (FNR), targeted in silico by C4, C5, C6, and C9, participated in numerous electron transfer reactions, had no homologous enzyme in humans, and was a target for the accumulation of multidrug-resistant microbial strains . The Streptomyces coelicolor TetR family protein ActR* was found by C19. ActR* may mediate timely self-resistance to an endogenously-produced antibiotic. TetR-mediated antibiotic-resistance might have been acquired from an antibiotic-producer organism . Two targets indicating other pathways were involved in the antibacterial activity. The ZipA-FtsZ complex was fished by C13, C14, and C20 (Fig. 8). ZipA was a membrane-anchored protein in E. coli that interacted with FtsZ-mediated bacterial cell division, and was considered a potential target for antibacterial agents . The target ENR catalyzed an essential step in fatty acid biosynthesis. ENR was a target for narrow-spectrum antibacterial drug discovery because of its essential role in metabolism and its sequence conservation across many bacterial species . M. cordata showed remarkable effects against Ichthyophthirius multifiliis in grass carp  and richadsin , as well as against Dactylogyrus intermedius in Carassius auratus . The total alkaloids of M. cordata were able to kill gastrointestinal parasites . In this study, five targets involved in parasitic diseases were predicted. Because of the lack of reported protein–ligand crystal structures for parasitosis, these five targets were not related to the above parasitosis in either humans or other animals. However, the findings suggested the potential of M. cordata to treat other parasitosis, such as malaria, Chagas disease, and Kala-azar. The enoyl-acyl carrier reductase PfENR* fished by two alkaloids (C5 and C26) and the (3R)-hydroxymyristoyl acyl carrier protein dehydratase FabZ* in silico targeted by six alkaloids (C5, C6, C9, C11, C12, and C16) were involved in the fatty acid biosynthesis of Plasmodium falciparum. The antioxidant enzyme GR fished by C13, C14, and C19 was a target for antimalarial drug development . The target glycosomal glyceraldehyde-3-phosphate dehydrogenase (GAPDH) found by C11 was a target for the development of novel chemotherapeutic agents for the treatment of Chagas disease . Dihydroorotate dehydrogenase (DHODH) retrieved by C5 and C6 was related to both Leishmania infection and Trypanosoma infection . A mixture of the isoquinoline alkaloids from M. cordata exhibited strong analgesic activity towards the pain caused by inflammatory cytokines and direct peripheral nerve stimulation . In this study, three targets related to pain were identified. nAChR7α was abundantly expressed in the central and peripheral nervous systems, and involved in subchronic pain and inflammation . In the profiling results, nAChR7α was picked out by five alkaloids (C2, C11, C15, C19, and C25). MAPK p38 fished by C9, C14, and C20 was involved in the development and maintenance of inflammatory pain [52, 53]. The reductase ALR fished by C19 was a specific target of painful diabetic neuropathy [54, 55]. Inhibitors of ALR relieved pain and improved somatic and autonomic nerve function . In addition, based on the action network, berberines (Ber) such as C19 and C20 may also be involved in the analgesic activity of M. cordata. Eight targets related to inflammation were identified in this study. Phosphatidylinositol-4, 5-bisphosphate 3-kinase catalytic subunit gamma isoform (PI3 Kγ) fished by C19 recruited leukocytes . The proteinase MMP12, also known as macrophage metalloelastase (MME) or macrophage elastase (ME), was identified with three fitted compounds (C3, C5, and C9) in this study. MMP12 mediated neutrophil and macrophage recruitment and T cell polarization , and was a potential therapeutic target for asthma . PPARγ* fished by C3 was another inflammation-related target. Some early findings demonstrated the anti-inflammatory effects of PPARγ by activating human or murine monocytes/macrophages and monocyte/macrophage cell lines . MAPK p38 was involved in a signaling cascade controlling cellular responses to inflammatory cytokines, and it was verified for this pathway in murine macrophage RAW264.7 cells that the M. cordata extract increased both the mRNA and protein levels of cytoprotective enzymes including heme oxygenase-1 (HO-1) and thioredoxin 1 via activation of the p38 MAPK/Nrf2 pathway . The kinase calcium/calmodulin-dependent protein kinase II (CAMKII) was a regulator of intracellular Ca2+ levels, which triggered activation of the transcription factor nuclear factor-kappa B (NF-κB) after T-cell receptor stimulation. An inhibitory effect of CAMKII on NF-κB was confirmed . Phospholipase A2 (PLA2s) was a key enzyme in prostaglandin (PG) biosynthesis for discharging arachidonic acid. Selective inhibitors of PLA2s were implicated in inflammation and connected to diverse diseases, such as cancer, ischemia, atherosclerosis, and schizophrenia . The target mineralocorticoid receptor (MR) fished by five compounds (C3, C4, C6, C7, and C20) was activated by mineralocorticoids, such as aldosterone and deoxycorticosterone, as well as by glucocorticoids, like cortisol. Antagonists of MR had cardioprotective and anti-inflammatory effects in vivo via aldosterone-independent mechanisms . Macrophage migration inhibitory factor (MIF) was involved in both innate and adaptive immune responses. Inhibitors of MIF were potential anti-inflammatory agents . Seven of the eight predicted targets were also related to cancer. These dual correlative targets were PI3Kγ, MMP12, PPARγ*, MAPK p38, CAMKII, PLA2s, and MIF. Their matching compounds are shown in Fig. 9, and the benzo[c]phenanthridine (Ben) alkaloids and berberine (Ber) alkaloids were involved in the anti-inflammatory activity. In this study, four predicted targets (ERα*, ERβ*, MR, and COMP) were involved in injury repair. Among them, ERα*, ERβ*, and MR were linked with internal injuries, such as brain injury , vascular injury , and neuronal injury . The other target, cartilage oligomeric matrix protein (COMP), found by C9 was a non-collagenous extracellular matrix protein found predominantly in cartilage, but also in tendon, ligament, and meniscus . COMP was a marker for joint destruction associated with osteoarthritis, rheumatoid arthritis, trauma, and intense activity . Both the mixed and single alkaloids of M. cordata strongly inhibited proliferation and induced apoptosis of cancer cells [6, 70]. The anticancer drug Ukrain™ is an isoquinoline type. The major components of Ukrain™ are chelidonine, sanguinarine, chelerythrine, protopine, and allocryptopine. Ukrain™ exerted cytotoxic effects in cancer cells without negative effects on normal cells , and had radiosensitization effects on cancer cells, while exerting radioprotective effects on normal cells . In the pharmacological profiling results, almost half of the predicted targets (31 of 65 targets) had a close relationship with cancer, and ten of them (Table 3) successfully entered into clinical trial observations. In total, nine targets related to cancer were fished by more than five compounds. The results revealed promising prospects for M. cordata in antitumor drug research and development. Based on the action network (Fig. 5), possible antitumor molecular mechanisms of M. cordata were analyzed as follows: (1) most possible effective targets and (2) most likely contributing compounds. The MIF column was particularly tall (Fig. 10) because it was fished by 15 compounds, including all quaternary benzo[c]phenanthridine (Ben) alkaloids (C11–C16), two other benzo[c]phenanthridine (Ben) alkaloids, five protoberberine (Ber) alkaloids, and two protopine (Pro) alkaloids. The discovered pathways of these 15 compounds mainly included NF-κB and ERK signaling pathways [73, 74], Bax/Bcl and caspase-dependent pathway , ROS-mediated mitochondrial pathway , p38 MAPK/Nrf2 pathway , and VEGF-induced Akt phosphorylation pathway . All of these pathways were linked closely with MIF [79–84]. However, there have been no experimental reports on to the interactions between MIF and these alkaloids. Both transthyretin (TTR) and proto-oncogene serine threonine kinase* (PIM-1) were found by seven compounds. TTR was a biomarker for lung cancer  and pancreatic ductal adenocarcinoma , but has not yet been confirmed as a therapeutic target. PIM-1* fished by C5, C6, C8, C9, C14, C19, and C20, and also verified by HypoDB screening, was responsible for cell cycle regulation, antiapoptotic activity, mediation of homing, and migration of receptor tyrosine kinases via the JAK/STAT pathway. PIM-1 was upregulated in many hematological malignancies and solid tumors. Although PIM kinases were described as weak oncogenes, they were heavily targeted for anticancer drug discovery . C12 was partially involved in the JAK/STAT pathway . The benzo[c]phenanthridine (Ben) alkaloids of M. cordata hit cancer-related targets a total of 75 times, compared with 25 times for protoberberines (Ber), five times for protopines (Pro), and one time for bis-benzo[c]phenanthridines (BisBen) (Fig. 11). According to the quantitative determination of alkaloids from M. cordata, the quaternary benzo[c]phenanthridine alkaloids C12, C13, and C15 were the main active components . However, the dihydro-benzo[c]phenanthridines such as C5, C6, and C9 rarely reached the limit of detection (LOD), and hit more targets than the main alkaloids. As the quaternary and dihydro-benzo[c]phenanthridines can be transformed into one another, the dihydro-benzo[c]phenanthridines could be active compounds in vivo. The metabolism of C15 was examined in pig liver microsomes and cytosol by electrospray ionization hybrid ion trap/time-of-flight mass spectrometry, and C7 was one of the main metabolites in liver microsomes and the only metabolite in cytosol . Hence, the issue of whether the dihydro-benzo[c]phenanthridines were the main compounds combining with the targets in vivo requires further investigation. Among the 31 cancer-related targets, at least seven (including MIF, PPARγ*, CAMKII, and Pi3Kγ) were involved in the immune system. These immune-associated targets might be crucial to for oncotherapy with M. cordata. According to the pharmacological profiling, some unreported pharmacological performances of M. cordata emerged. In this study, 10 targets linked with neurodegeneration were fished, among which AChE and MAO-B were crucial therapeutic targets in Alzheimer’s disease and Parkinson’s disease [91–94]. In addition, antiviral activities, especially anti-HIV, anti-SARS coronavirus, and antifungal activities, were kinds of extensions of the antibacterial function of M. cordata. The possible anti-HIV activity was notable, because HIV-1 reverse transcriptase and multidrug-resistant HIV-1 protease* were particularly related to AIDS [95–99]. Meanwhile, the anti-HIV activity was partly confirmed by HypoDB screening. The protein SARS-CoV M(pro) predicted by C3 and C5 was an attractive target for structure-based drug design of anti-SARS drugs owing to its indispensability for the maturation of severe acute respiratory syndrome coronavirus (SARS-CoV) . Another target, HS5B Pol, fished by five alkaloids was a target for anti-HCV therapeutic advances . Inhibitors of HS5B Pol would be a principal option for the treatment of HCV . Meanwhile, scytalone dehydratase and negative transcriptional regulator NmrA were suggested to be physiological targets of new fungicides and the subjects of inhibitor design and optimization [103–105]. In this paper, we proposed a very wide range of the promising targets for the isoquinoline alkaloids of M. cordata. Most of the hits are not yet proven by pharmacological experiment. Through in silicotarget fishing, the anticancer, anti-inflammatory, and analgesic effects of M. cordata were the most significant among many possible activities. The possible anticancer effects were mainly contributed by the isoquinoline alkaloids as active components. HBL, QFL, PGX and YP conceived and designed the study. HBL, QFL and PGX performed the experiments. HBL, QFL and YP wrote the manuscript. All authors read and approved the final manuscript. The authors would like to thank Prof. Jun Xu (Sun Yat-sen University, China) and Prof. Yanze Liu (IMPLAD, China) for assistance in preparing the manuscript and Dr. Rong Zhao (National Yang-Ming University, Taiwan) for assistance in analyzing the pathway. This work was supported by National Natural Science Foundation of China (Grant No. 81072995), and Peking Union Medical College Youth Fund (Grant No. 3332013079).